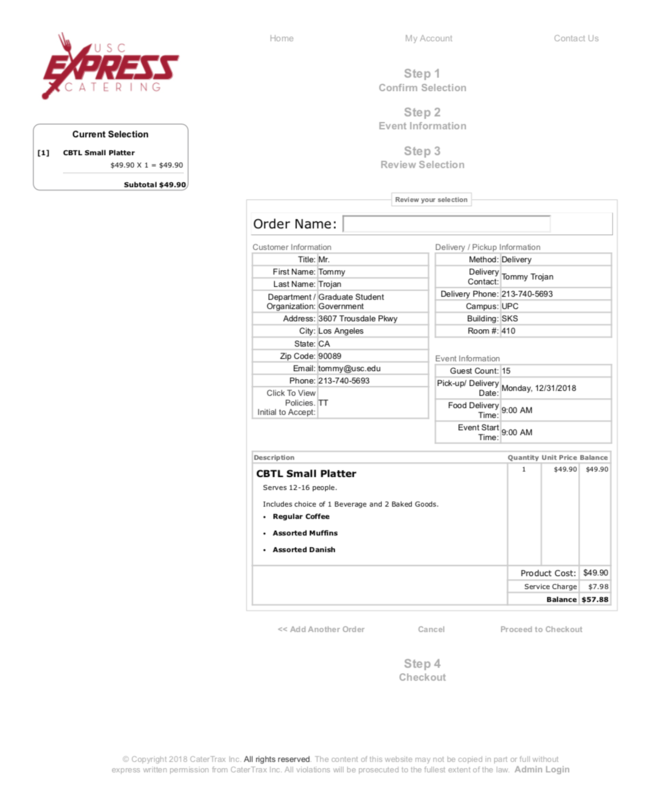 Once you know your application status, email Express Catering to either confirm your QUOTE as an order to fulfill, or to cancel it. Please contact gsgfinea@usc.edu with any questions, concerns, or feedback. Your thoughts are much appreciated! These important updates will be made to other areas of the website within the next week, so please be patient as we update each page and document. You should abide by these updates as you read them here. The Spring Application Period opens 10/21/18! The Spring Application Period is for events taking place during the Spring Semester ONLY. The Fall Application Period will close 10/28/18. All policy updates will apply to applications reviewed 10/22 and onward. NOTE: Applications for early Spring Semester events (Jan 7 – Feb 3) MUST be submitted within the posted deadlines (see Calendar of Submission Deadlines) for review this semester, despite being more than 4 weeks in advance. This is due to Study Days and Exams, Winter Break, as well as the time it takes to establish normal operating hours come January. Funding applications reviewed on Monday 10/22 and beyond will be subject to new Amazon policies. Broadly, Amazon may only be used for purchasing Justifiable specialty items that cannot be purchased elsewhere, and Amazon gift cards. Due to logistics we are not able to continue using Amazon for products that can be purchased through other vendors such as Smart and Final, Oriental Trading, the USC Bookstore, and Office Depot. If there is an item(s) that is essential to your event, you must provide the rational (several sentences minimum, 2 paragraph maximum) for needing the item(s) along with your funding application and a screenshot of an Amazon cart. This can be uploaded as a single PDF within the quote section of your funding application request. The item must be available using Prime shipping. Items are subject to a comparable substitution (e.g. the nature of the item is similar but the color may not be exact, the size of the item may change, etc.). If an item is unavailable at the time of the purchase GSG will contact the applicant to discuss alternative options. Orders will be placed 1-2 weeks out from the event date, no earlier unless specified. All deliveries will be to SKS 410 and students must pick up items within 3-5 business days. Students will be notified through the funding application system (Pluto) when orders are placed, expected to arrive, and available for pick up. Amazon gift cards are the only option allowed (no gift cards from other vendors) to be purchased from Amazon moving forward. Amounts for prizes can vary, but any gift cards for appreciation gifts must be in equal amounts. A single person may not be a recipient of two or more gift cards. Gift cards will be issued electronically via email after the event. The applicant submits gift card purchase information with their funding application. After the event is held, the applicant will submit the gift card recipient list along with the post event materials within 5 business days of the event. The recipient list must include the following information for each person: name, email address, student ID number (if applicable) and the reason for issuing the gift card. The recipient will receive the e-gift card via email within one week of receipt of the post event materials. Formal quotes are still required, but if you have difficulty getting formal quotes by emailing or calling Express Catering, or other internal vendors, please send a PDF of your order from Step 3 (Review Selection) during the online ordering process. You should NOT continue to checkout or complete an online order request until you have obtained GSG funding and an Internal Requisition to use for payment. IRs signed by the Director of Campus Activities are uploaded to applications, NOT directly sent to internal vendors. Applicants must utilize the IR number to place orders and to pay using a printed copy if needed. Please contact gsgfinea@usc.edu if you encounter any issues. To order from these vendors, place items in an online cart and take a screenshot before checkout. Both vendors deliver to the SKS 410 Office ONLY. Some vendors have multiple locations across LA. Please be certain that you are using an approved location (e.g. Togos on Vermont). The Recipient Memo provided on the Finance Resources must be used whenever physical items are given as a prize or gift. Take the Memo with you to your event to get a signature from the recipient acknowledging receipt. This memo does not apply to electronic Amazon gift cards. Enter desired delivery location – we ship it straight to you! Upload screenshot from checkout as your quote. For e-gift cards, only enter recipient’s information. You can only request e-gift cards if you know this information in advance. Otherwise request a physical card. If your request for GSG funds is for a partial payment to a vendor, the quote must be for the GSG portion ONLY – we will not accept quotes or final invoices/receipts over the approved amount. The first two weeks are expected to fluctuate for appointment availability. It is YOUR responsibility to contact uscgsgfin@gmail.com to schedule. Your appointment time is your CHECK OUT time. You are REQUIRED to submit at least one photo of your event to shows its success and potential for future funding. Internal vendors are the easiest to use for events. Check out USC Hospitality to get an idea of which internal vendors are available. External “approved” vendors are overseen by the USC Business Office, NOT GSG. We provided a meager list of “frequently used” vendors in our Finance Resources, but we cannot provide a complete list as it is always changing. Call your vendor to confirm they accept POs from USC! All payment info is uploaded directly to the corresponding expense. Click to view the expense to utilize IR, PO, and IBR numbers. You can also download and print your IR to use. Amazon order numbers and expected delivery dates are entered into the FA notes section. Check out the upcoming events funded by GSG! All graduate students are welcome at these events. Contact gsgfinea@usc.edu if you have any difficulty accessing these events. The Fall Application Period is open! The online portal has been released. Recipient, Transportation, and Umbrella Fund Approval Memos have been added to the Finance Resources. Umbrella resources have been uploaded to the Finance Resources. Templates for budgets, Umbrella Fund policies and applications are available. Finance Orientation has been updated. The 2018-2019 Finance Orientation has been added. The Spring 2018 Report and FY18 Annual Report for RSO Event Funding have been posted to the Finance Resources page. The Umbrella Fund Disbursement Program (UFDP, formerly OFDP) has been opened. The updated agreement has been added to the Finance Resources page. If an Umbrella is re-enrolling, the previous year’s Final Report is due before re-enrollment. The Student Affairs VP Approval Form and Intent to Use Form have been updated and added to the Finance Resources page. Hyperlinks and resources will be incorporated shortly. The Budget Application and Expense Request forms have been combined. This will reduce deadlines to 4 weeks! We have divided the year into two application periods to prevent overusing funds during a single semester. The Fall Application Period runs August-October and the Spring Application Period runs October-April. Applicants will still be expected to follow the 2018-2019 Calendar of Submission Deadlines. Umbrella Organizations will be expected to provide an annual budget, published policies for RSOs to request their respective Umbrella Funds, and a general organization email. Ideally these will be ready (or drafted) by the second week of the fall semester. GSG will now fund promotional items like t-shirts and printing costs. Gifts cards may also be requested. Honoraria (payments for speaker fees) have been discontinued due to logistical issues. Only physical gifts or gift cards are allowable requests. Amazon is now an approved vendor! Additional updates may be made to policy language as we continue to work with Campus Activities. Sign up for our new GSG Finance Newsletter to receive notifications for reliable updates on funding! Major policy changes and additions will be summarized for the first issue. The Newsletter will also provide information on Travel Grants Program, Emergency Fund Program, and Childcare Subsidy Grants Program. The 2018-2019 Finance Orientation and Assessment will be available soon. Watch for updates in the next week. The Umbrella Fund Disbursement Program (UFDP, formerly OFDP) will be available within the next week.